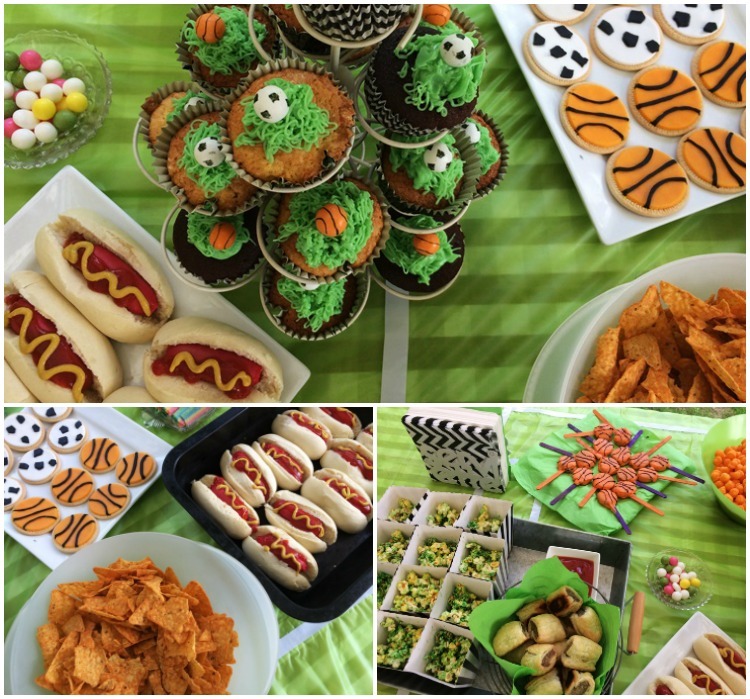 The beginning of the week looked like rain, so I planned to set up the eats inside, hanging flag bunting and setting up the buffet ahead of time. I needn't have bothered, cos on the day the sun was shining and we moved the whole thing back outside. 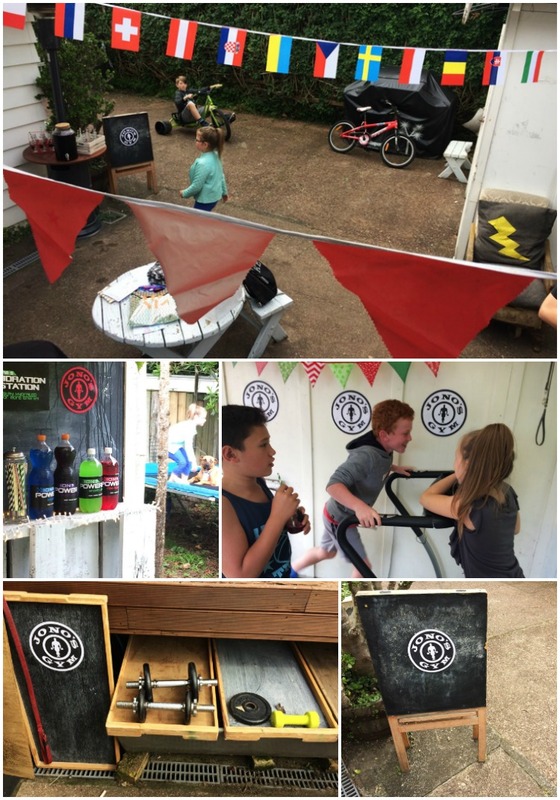 We'd decided to set up our outdoor covered area as a "gym" where the guests could "work out" when they arrived. I created a logo ("Jono's Gym" based on "Gold's Gym") in Photoshop for signage which helped create the atmosphere. We dragged the treadmill and rowing machine out of the garage, set up a weights area and borrowed some boxing gloves for the punching bag. The gym was a huge hit. Reusing bunting from parties past, and adding some more European flag bunting (super cheap from Ali Express) made the whole thing very festive. 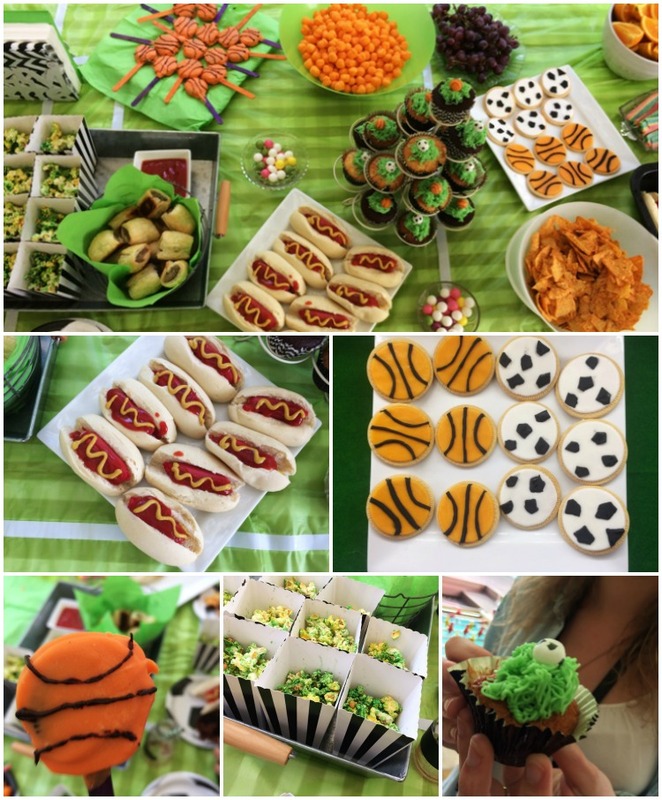 Food was as sports themed as I could get it. Scrag and I had spent time on Pinterest together getting ideas, and he was very specific about what he wanted. I did my best! Basketball Oreo Pops: Made by poking iceblock sticks into Oreo cookies, then dipping each one into melted orange candy melts. (Tip: Melt the "melts" in a china bowl over a pot of boiling water; add canola oil to give a smooth, runny consistency to allow for easy dipping - Mine would have worked better if I'd used real Oreos instead of cheap Wheelies which kept falling apart - but you get the idea). I was originally planning to just have personalised sipper bottles and plenty of water to drink, but Scrag had other ideas, requesting that I make some of my famous soda bottle labels, in the style of PowerAde and stick them on coloured fizzy drinks.Oh well. I figured the kids would probably need the sugar boost with the non-stop activities Scrag had planned for them.... (He was pretty chuffed with how the drinks turned out). 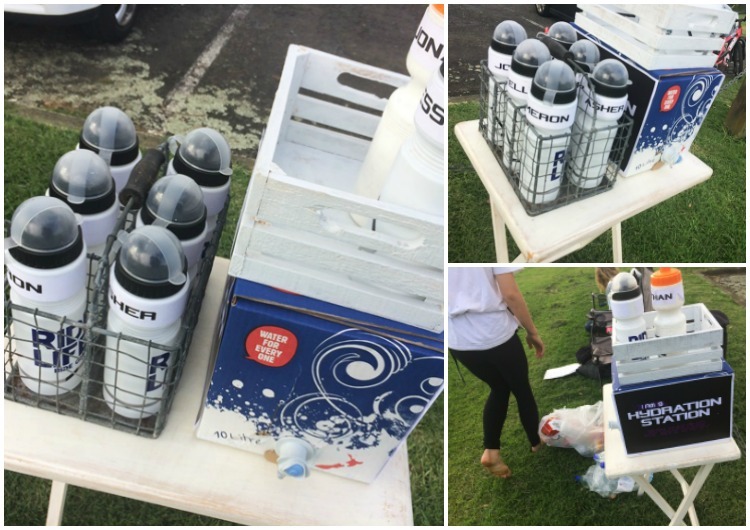 We took a box of "Water for everyone" down with us to the local sports ground when it was time for the games. Everyone had their own specially labelled sipper bottle to use and take home afterwards (found super-cheap on Ali Express). 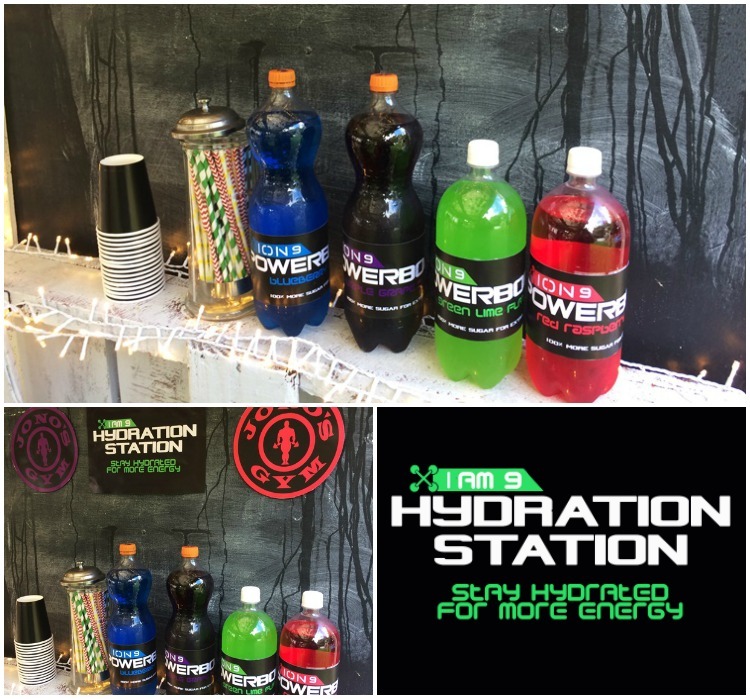 We set up a Hydration Station and made sure everyone stayed hydrated! 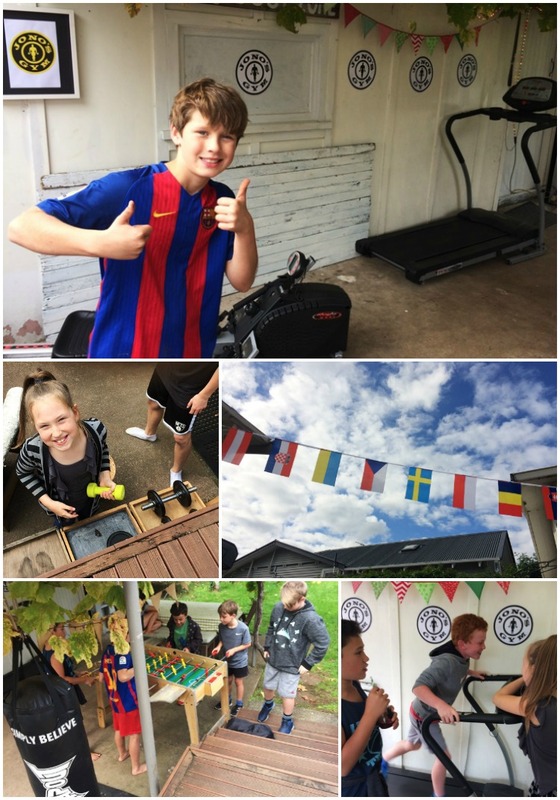 After the kids had worked out in Scrag's Gym, tucked into a Sporty feast and battled out a few rounds of foozeball, they walked around the corner to our local football club where we had set up cones and a hydration station and were ready for action. 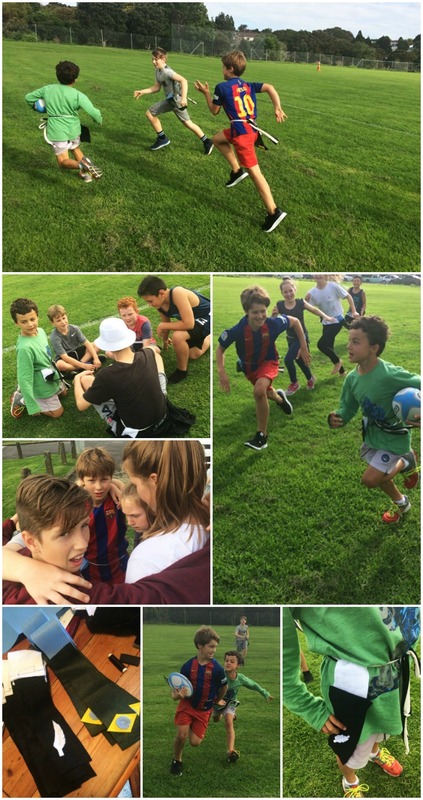 First up, a game of "rippa" rugby (aka tag football) - with my homemade "rips" decorated with the symbols of Scrag's two favourite countries - Brazil and New Zealand. I made these from felt, a belt loop and a tag, which velcroed together. The game is primarily touch rugby but instead of touching (or tackling) a player to get the ball, you have to grab their "tag" and pull it off. After three rips in a row, possession changes. We ended up with two very competitive teams: Big Brother captaining a team of Scrag's friends vs. Little Brother captaining a team of cousins + sis. Intense stuff! When the Bumper Ball guy arrived, fun really began. The pictures say it all really. It was meant to be a serious "scored" game of bubble soccer but it turned into simple joyful mayhem with everyone landing upside down plenty of times, and much laughter. Having Bumper Ball at our party really gave the whole day a sense of excitement and anticipation. it was The Main Event that the kids couldn't wait for. As a non-sporty parent I was very glad to see the van pull up and those giant wearable balls appear. Hilarious to watch, and fun to do (apparently). I mean, just look at those faces! Scrag is mad on Usain Bolt and his Sports Party would not be complete without some running races. We'd planned to have a whole bunch of different ones, but time got away on us so we ended up just running a series of relay races (with our pool diving sticks serving as batons). Scrag was mostly satisfied with the way his plans played out in real life, though he did wish we could have run more races. On a real running track. With lanes and a starter gun. But we do what we can, right? This cake was very very simple - but did the job and the birthday boy was impressed. It was another one of my amateur, slightly wobbly DIY efforts (don't look too close) but it was ooohed and ahhhhed over by the birthday boy and his pals and then gobbled up with glee. A simple two-layer chocolate cake, with green buttercream between the layers and on top, then overlaid with a homemade fondant soccer ball. I'm always relieved when my ideas work out - and this one actually did! Voila! 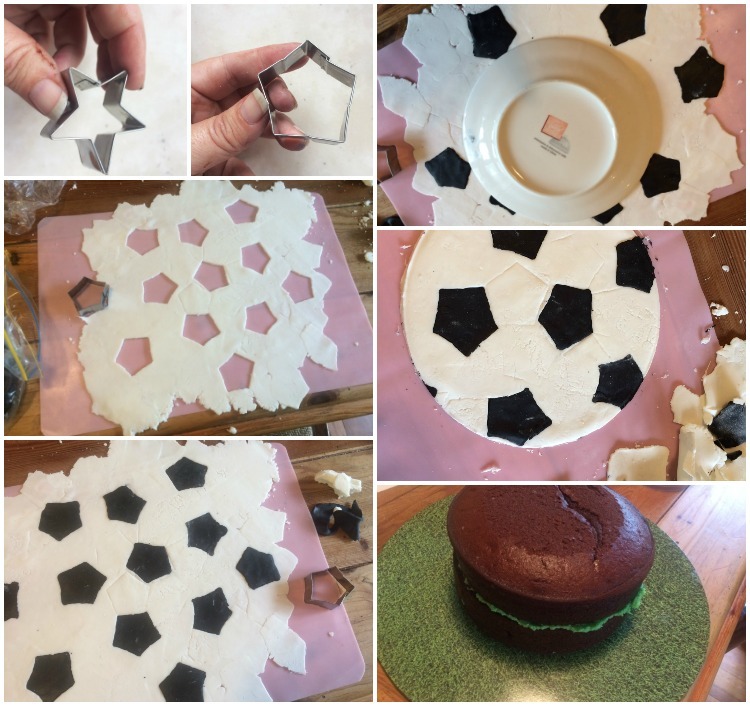 A DIY Soccer Ball Cake! So there you have it. 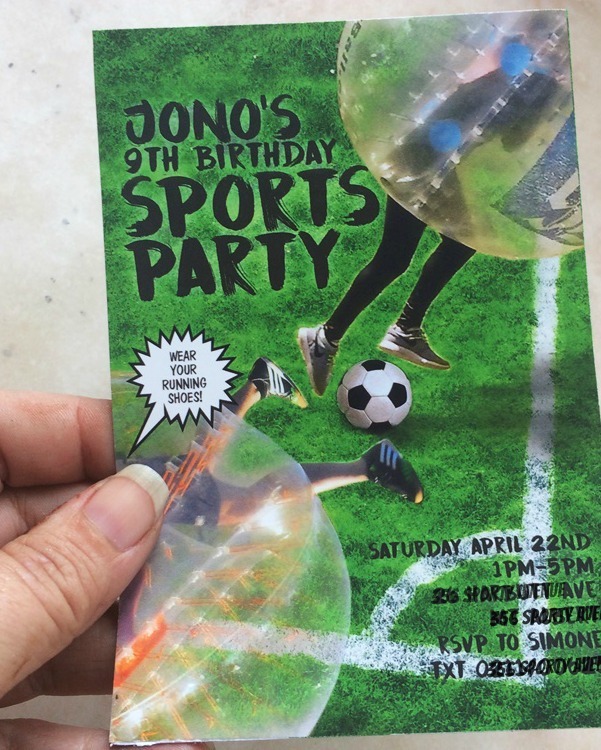 An action packed birthday party for a sports-mad nine-year-old. Done and dusted and enjoyed by all. 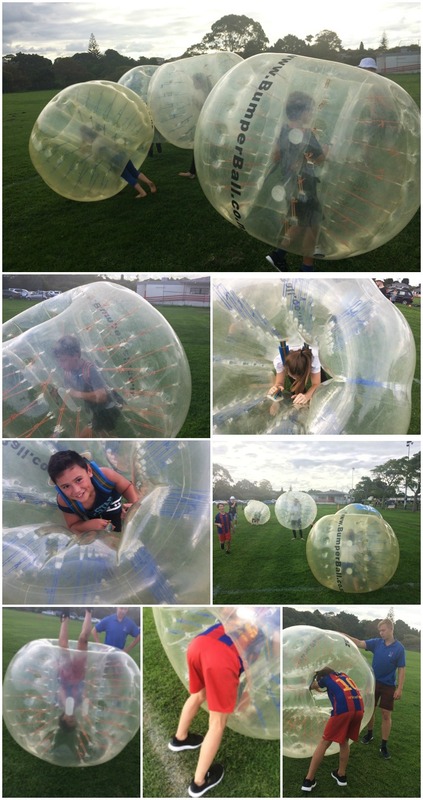 MASSIVE THANKS TO THE GUYS AT BUMPERBALL.CO.NZ for helping make this party so epic! 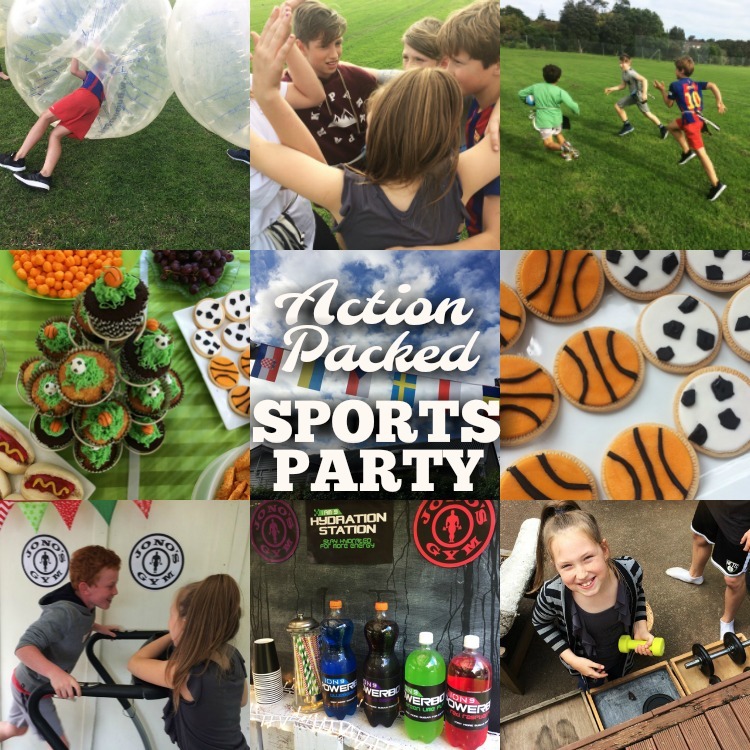 We thoroughly recommend Bumper Ball for amazing party fun for all ages (7+). 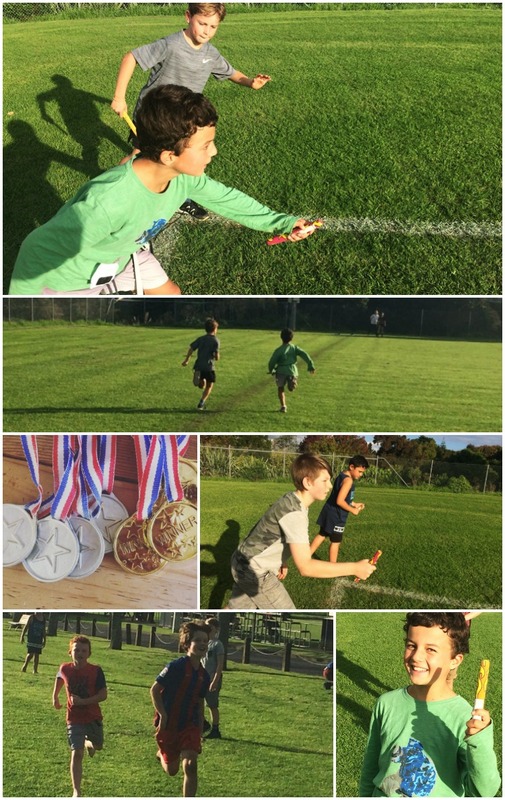 They operate in locations all around New Zealand and come to you at your venue (park, sports field or huge backyard). LOCATIONS AROUND NZ: Check out the regions they operate in around New Zealand.